Ellen Rogers "Ella" (Minerd) Pritts Polen Pryor was born on May 29, 1874 at Rogers Mills, Fayette County, PA, the daughter of Joel and Catherine (Seneff) Minerd. At age 19, Ellen joined her church. The June 28, 1895 Connellsville Courier reported that "About three hundred people gathered at the backwater in Indian Creek near Rodgers' Mill on Sunday ... to witness the ordinance of baptism. The following named persons were immersed: ... Ella Miner..."
On Sunday, Nov. 15, 1896, when both were age 22, Ellen married Ludwick H. (or "Ludwig") Pritts (May 1874-1903? ), the son of Osborne and Mary Pritts. The service was held at his residence in Normalville, Springfield Township, Fayette County, PA, by the hand of justice of the peace A.G.C. Sherbondy. They went on to produce two known children -- Bessie "Ruby" Healey and Roy Pritts. I was suffering with general debility. I woke in the morning with a dull, tired feeling which remained with me all day. My sleep was broken and restless. I read how many had been cured by taking Hood's Sarsaparilla and I began its use. When I had taken four bottles I was cured. In 1898, the Prittses lived at Vanderbilt, where Ludwick earned a living as a laborer. In the census of 1900, they resided near Normalville, Springfield Township. Tragically, Ludwick is believed to have died on Sept. 13, 1903. The cause is not yet known. Or perhaps they were divorced on that date. This breakage of the marital union left Ella as a single mother at the age of 31. After 27 months alone, Ella married again, to Ebenezer Bell Polen (Jan. 9, 1882-1947), the son of Nathaniel "Lewis" and Ida (Welsh) Polen of Hopedale, Harrison County, OH. The bride and groom united themselves in marriage in Uniontown, Fayette County, on Jan. 2, 1906, after securing a marriage license. Ella was age 31, and Ebenezer age 23. Ebenezer brought young a son to the marriage, Carl Polen. They relocated into Ebenezer's home in or near Hopedale, in eastern Ohio, about 18 miles to the west and slightly south of the city of Steubenville. The United States census of 1910 shows "Ebinezer" and "Ella" Polen living as farmers in Green Township, Harrison County, OH. They had been married for four years, but had no children. Ella and Ebenezer were mentioned by name in a Minerd family history written in August 1913 by cousin Allen Edward Harbaugh ("The Mountain Poet"), and read aloud at the clan's first-ever reunion at Ohio Pyle, Fayette County. After the outbreak of World War I, Ebenezer was required to register for the military draft. Age 36 at the time, he disclosed that he resided in Bloomingdale, Jefferson County, and was a self-employed farmer. He named his nearest relative as "Ella Rogers Polen." The registration clerk listed him as of medium height and build, with brown eyes and black hair. By 1920, the Polens migrated a short distance away to Wayne Township, Jefferson County, OH. That year, Ebenezer was a brakeman in a local coal mine. Ebenezer's 17-year-old son, Carl Polen, also made his home with them that year, with Carl working as a yardman on the section railroad. The Polens' marriage dissolved by the mid-1920s. Details and dates are not known. Ebenezer married again in about 1926, to Anna Lisle (1886- ? ), daughter of Elizabeth M. Lisle. In 1930, census records showing them living in Archer, Harrison County, with Anna's aged mother under their roof, presumably on the farm of Anna's parents. It was located one quarter mile east of the Gilmore schoolhouse, six miles northwest of Cadiz. Ellen's death (orange dot) noted in the Bible of her brother William "Henry"
After selling the Lisle farm in the early 1940s, Ebenezer and his wife Anna relocated to Jewett, Harrison County, with Ebenezer working as a highway maintenance employee. 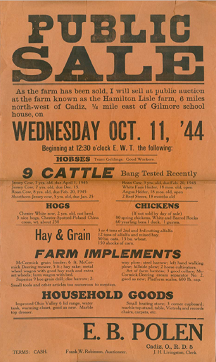 On Oct. 11, 1944, Ebenezer held a public auction at the old farm, with items available for bidding including cattle, hogs, chickens, hay, grain, farm implements and household goods. An original orange poster advertising the sale is preserved today in the Minerd.com Archives. He suffered a fatal heart attack in Newett at the age of 65, on Aug. 22, 1947. He was laid to rest in the Cadiz Cemetery. His obituary in the Steubenville (OH) Herald Star did not disclose the whereabouts of his son Carl, but listed Ebenezer's surviving siblings as Robert Polen, Mrs. Charles Busby, Mae Williams and Clara Lewellyn. Our Ellen was not named in the article. Later, Ellen reputedly went on to marry a third husband, (?) Pryor. The "Pryor" name handwritten in inscriptions in the family Bible of her brother, William Henry "Squire" Miner, of Mill Run. The Bible contains a handwritten notation stating that she died on June 11, 1951, at age 77, but this needs to be confirmed. If she died on that date, no obituary has been found in contemporary editions of local newspapers the Steubenville Herald-Star or the Cadiz Republican. More will be added here when learned. Daughter Bessie "Ruby" Pritts (1896-1952) was born on March 14, 1896 or May 1897 in Springfield Township, Fayette County. Ruby was age seven when her father died. After her mother remarried, and moved to Ohio, Ruby made her way to Toledo, Lucas County, OH. There, at age 23, she resided circa 1919 at 1826 14th Street. On July 2, 1919, the 23-year-old Ruby married 27-year-old Joseph Stephen Healey (1892-1947) in municipal court in Toledo, officiated by Judge James Austin. Joseph was the son of James J. and Ella (Harman) Healey of Toledo. At the time of marriage, he dwelled at 927 Stilman Street in Toledo and was employed as a clerk. In 1920, a year after marriage, Joseph and Ruby lived on Bowman Street in Toledo. They had no known children. 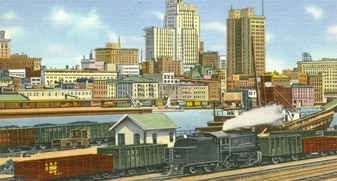 Joseph's occupation for many years was as a clerk in the offices of the New York Central Railroad in Toledo. The 1930 federal census shows James and Ruby rooming in the Ontario Road household of Albert and Elizabeth Van Norman in Toledo. James' occupation was as a clerk with the NYCRR, and Ruby as a "caberess" at the local golf club. In the 1940s, the Healeys made their residence in Toledo at 3141 Schneider Road, and kept commercial painter John Caterino under their roof as a lodger. Evidence suggests that Ruby was an antique dealer in Toledo. If so, in May 1948, she took part in a Centennial Antique Show sponsored by St. John's Episcopal Church of Lancaster, OH, in cooperation with the Lancaster YMCA, held at the Sherman Memorial Armory. Tragically, James died at work of a heart attack, at the age of 54, on Feb. 4, 1947, in the round house of the railroad's Air Line Junction. He was laid to rest in the Woodlawn Cemetery. Ruby survived her husband by five years. She succumbed in 1952 and rests for eternity in Woodlawn Cemetery in Toledo. Her and her husband's flat grave markers are partially buried in the earth. Son Roy Pritts (1898- ? ) was born in October 1898, presumably in Springfield Township, Fayette County. At the age of two, he resided with his parents in Springfield Township. Nothing more is known.